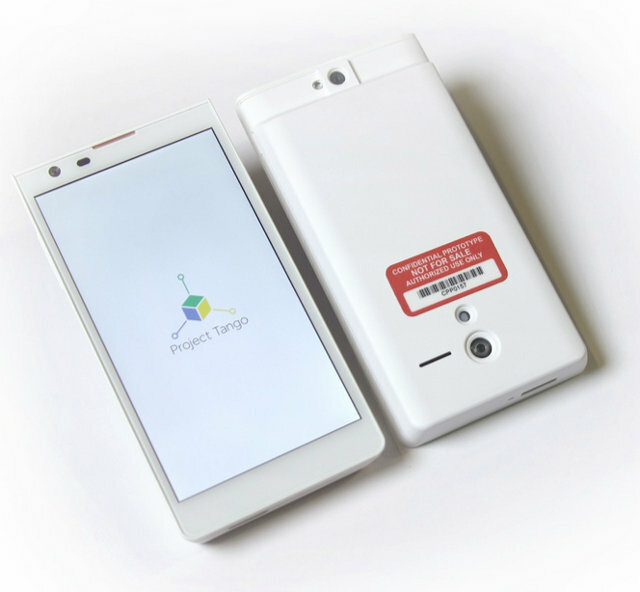 Google ATAP (Advanced Technology and Products), the team who is currently working on Project Ara for Google, and recently moved from Motorola following the acquisition by Lenovo, has also been busy on another project called Tango, which centers around a phone equipped with cameras and sensors capturing 250,000 data points per second to track motion and generate 3D maps in real-time. The prototype is 5” phone with hardware and software customization designed to simultaneously track the 3D motion of the device, and creating a 3D map of the environment. The device runs Android and includes development APIs to provide position, orientation, and depth data to standard Java, C/C++ Android. This is still early development, but the team imagine the technology could be used to easily create a 3D map of your home, facilitating furniture shopping. Other usa cses include indoor navigations, visually-impaired aid, and product location in a store. Augmented reality games could also leverage the technology. In some ways, it remind me of the demo of Intel’s RealSense technology at CES 2014 showing a tablet capture 3D models of physical objects. The company is now looking for professional developers, incorporated entities or institutions only due to FCC regulations, who can create apps with this technology, and plan to send 200 prototype development kits to selected companies. They have allocated units for projects in the areas of indoor navigation/mapping, single/multiplayer games that use physical space, and new algorithms for processing sensor data, as well as some units for others applications. Kits will be sent by March 14th, 2014. You can find more application about the project, and/or apply for a development kit on ATAP Tango page.